Shar Pei Breeders & Puppies For Sale If your a breeder or have puppies for sale, send us your details for free and we will add to our Shar Pei Breeders page. 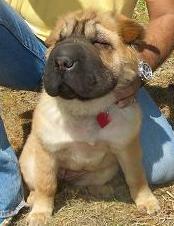 Shar Pei Rescue Center See if there's Shar Pei rescue center near you, or send us details of a rescue center. Origin / History The Shar Pei originated in China where it was bred for both fighting and hunting hence there small ears and deep set eyes within wrinkled facial features. If bitten they could turn around the neck or withers and reach the attacker. The Western world Shar Pei is now quite different from the Traditional Chinese Shar Pei, which is often referred to as a Bone Mouth Shar Pei. When Traditional Shar Pei were introduced to the U.S in the 1970's its thought it was crossed with Neapolitan Mastiff to create the more wrinkled features which is why it is referred to by some at the meat-faced, or Meat Mouth Shar Pei. 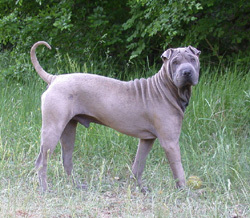 Since its introduction to the U.S the Shar Pei has become a more cumbersome dog with a large number of health issues bought on by over breeding. Some people harshly refer to the dog breed as "diseases in wrinkles". Far different to the original healthy breed from China. At one point the Shar Pei was close to extinction and named the rarest dog in the world. This is what lead to over breeding by non reputable breeders in the Western world, which has lead to some behaviour problems and many health issues that we see today in the meat mouth Shar Pei. 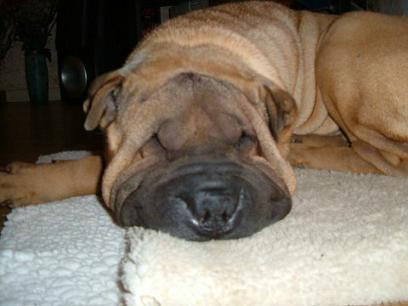 The Traditional Shar Pei is a much healthier breed. Some people refer to this breed as the Golden Lion. Appearance A wrinkly skin dog. As puppies the skin looks very oversized for the dog. They grow into the skin as they get older but still retain wrinkle features around the face neck and shoulders. There are 3 different breed types, some more wrinkly than others. The 2 shorter coat breeds are the Horse Coat and the Brush Coat. The shorter coat of the 2 is the Horse coat and is the original type of coat before the breed was introduced to the U.S. There's also a Bear Coat breed which has much longer hair and in some cases covers the wrinkle features. They have small triangle shaped ears. There head resembles a hippo. They have long high set tail which is usually carried in a curl. They have a blue, black tongue. Colours Sand, cream, black, red, chocolate, apricot. Temperament Strong minded. From there origin as guard dogs they can be weary of strangers. Loyal and protective of family, but expect them to bark at strangers. Important to socialise the puppies with people and other dogs. They can be good companion dogs and of course good guard dogs. They generally do not like water and will stay out of it. The Horse Coat is thought to be a more lively breed than the Brush Coat. Height and Weight 46 - 51 cm in height and approximately 18 - 25 kg in weight. 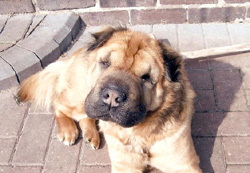 Common Health Problems Shar Pei Fever an inherited illness which can affect this breed. Sometimes also referred to as "Swollen Hock Syndrome". Results in the dog suffering a 24 hour fever as well as swelling of joints and can effect kidneys and lead to reduce lifespan of dog. Various eye problems including inward turning eyelids (entropion) or dropping lower lids, blocked tear ducts. Some of these problems may need very expensive operations to put right. Possible skin problems usually bought on by allergies. This is one of the problems bought about by over breeding in the 1980's and is not to do with there wrinkly features. Small ears need regular cleaning. Living Conditions Can live anywhere, town, country, house or apartment. Of course if in an apartment will need extra exercise. Like all small faced breeds the Shar Pei can overheat more easily so needs access to shade and plenty of water on warm days. Exercise Requirements Medium energy dog which enjoys regular walks. Training Requirements This is a strong minded dog that needs firm obedience training and good leadership for it to achieve the best resultsit can. Life Expectancy 10 - 12 years. Expect shorter lifespan if suffers from Shar Pei Fever. Grooming Low maintenance, once a week with bristle brush. Small ears will need regular cleaning. Famous Examples Jonathon Knight from early 1990's pop group New Kids on the Block famously had a Shar Pei which featured in many pictures with him. CompleteDogsGuide Comment These dogs may look really cute as puppies but remember they were bred for fighting and hunting. They are strong minded and bodied dog. They need good firm handling and leadership. They also may also suffer a wide range of health problems so if you do really want one make sure you buy from a very reputable breeder.